Hololens is using hardware acceleration to gain 200x the performance of a software based solution? Hmm, where have I heard of using hardware acceleration to boost console efficiency before? It had something to do with needing Win 10 and DX12 in order to enable... oh yeah, XB1! Now think how powerful Scorpio will be with 6tf raw performance and hardware acceleration too! Direct X-Static Too bad only few MS exclusives will use it...not on max too because it will be too complicated to change engines to DSP processing for main rendering pipeline. 2nd 😂 ......COD 2 BC, massive frame rate improvements. Assetto Corsa is out......anybody played this? Worth buying? Surprised DF haven't done any comparison's as of yet......apparently you can flatspot and blister your tyres. I haven't, but was disappointed to hear that there are no private lobbies on consoles. I'm interested in trying the handing of this game only as the graphics are....well something of an acquired taste. Looked at some videos from Xbox community and holy screen tear Batman😂. There you have it from the horses mouth before DF trash talk the game on Xbox one. Hopefully they test it on Xbox one S 4K also😏 Devs put in the work and admit if you put the extra work in you get results......which in the future will actually mean less work as everyone adopts DX12 😏. Anyway back to Assetto! I love a good racing sim so am also looking to see what peoples impressions are for the game. I would love a more simmy game that Forza but that performance has got to be rock solid 60fps for it to pique my interest. We have been well and truly spoiled with the performance of Forza Motorsport on the Xone and anything less now is just not satisfactory, it has set the bar really high. I am not too bothered if the graphics on Assetto are not as good, if the amount of cars is less or if there is different weather or not, number one for me is the smoothness of it. Project Cars didn't cut it but I am holding out a little bit of hope for this game. I think I'm going to give it a try as it's reasonably priced £39, and I have a TX/playseat and 4K set-up. And, from what i've read about performance today it doesn't look great there either, terrible in fact. If they had nailed performance then I might have considered buying a wheel but looks like I don't have to worry about it now. When there's no need to give the PS4 the win in resolution anymore, 1080p will be the norm now. "At the moment, the HPU operates at no more than 50 percent of its capacity, with plenty of compute cycles still available." Xbox One was said to release power over time. Now we get confirmation that MS is doing the same on It's Hololens. Further is that custom DSP with stacked ram is the route MS has been using. Xbox One SOC uses specialized audio DSP's. When it was released the gaming websites pounded in the lie that it was an AMD audio DSP that is used in PC's. Not only is the audio DSP specialized but the XBox One uses custom DSP in other area's of the SOC. The 'Esram' stack with custom DSP underneath at 28nm isn't just academic, but we see it in practice on HPU in the Hololens. Remember the Hololens was birthed out of the Xbox division! 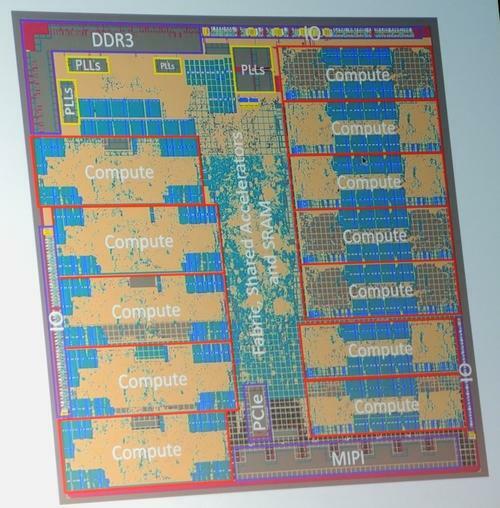 So do we have proof that MS releases power over time on It's custom chips? Yes. We can say the custom IP in the Xbox One SOC is DSP in nature to a very high degree now. In the article you'll notice fixed functions with general processing abilities are a part of the DSP's. Things that we've been saying on this site for years about the Xbox One SOC. 200X faster than general processing in this HPU at 10 watts. Crazy boosts that this site was made fun of, MS has revealed on the HPU. The weaker SOC on the Xbox One? No. Just a different type of SOC. The original marketing of the Xbox One was horrible. The refresh of the Slim and Scorpio is It's redemption. Interesting post. More proof about the MS SOC strategy although it is very puzzling that they are playing it the way they are. If we assume that Scorpio is a new much more powerful piece of hardware built in the same way then that also will have unused power that can be unlocked over time? It really begs the question about why they are releasing new much more powerful hardware when there is still plenty to be unlocked in the current consoles, what are the reasons behind this? "Port connections can be up to 1024 wires wide, allowing wide data types to be transferred easily without the need for multiple load/store operations. As many as one million signals (1000 1024-bit-wide ports) can be used. While this number far exceeds the performance demands of real systems today, this clearly demonstrates that the conventional I/O bottlenecks inherent in a system-bus-based solution do not apply to Xtensa processors." As far as slim and scorpio it is more about perception than pure tech. It will happen on OG XB1 for sure. Games will not only have parity with PS4, but will surpass it when the true nature of DX12 in Xbox is realized. 1st wave of DX12 games are out and barely touch what the API can do. Beta tested in the future. Marathon, not a sprint. The issue lies in devs are not programming for fixed function units, they are coding the same was they did for old PC's, PC / GPU which is why the ps4 leads in 'resolution' some times. does ue4 have it too? dont think so.